Cloud-based data presents a wealth of potential information for organizations seeking to build and maintain competitive advantage in their industries. However, as discussed in “The truth about information governance and the cloud,” most organizations will be challenged to reconcile their legacy on-premises data with new third-party cloud-based data. It is within these “hybrid” environments that people will look for insights to make critical decisions. 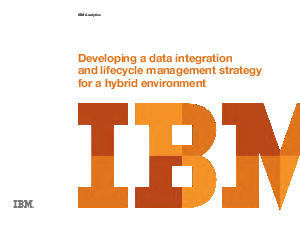 Hybrid environments generally grow without much advance planning, making the task of managing ever-growing data stores all the more difficult. Yet, there is a way to make sense of the chaos. As always, the first step is understanding the nature of the problem. The primary focus must be on the data itself, rather than the sources of the data and the systems used to manage the data. If you make data and ownership of information derived from the data the top priority, everything else falls into place quickly.